Vacation rental duplex. Sleeps 8, 2 bedrooms, 2 bathrooms. No pets allowed. 2 Bedroom, 2 Bath duplex with a full sized kitchen, matching appliances, large counter with seating. Living room features a large fireplace, high cathedral ceilings and southern exposure windows, large couch facing fireplace and TV, VCR/DVD. 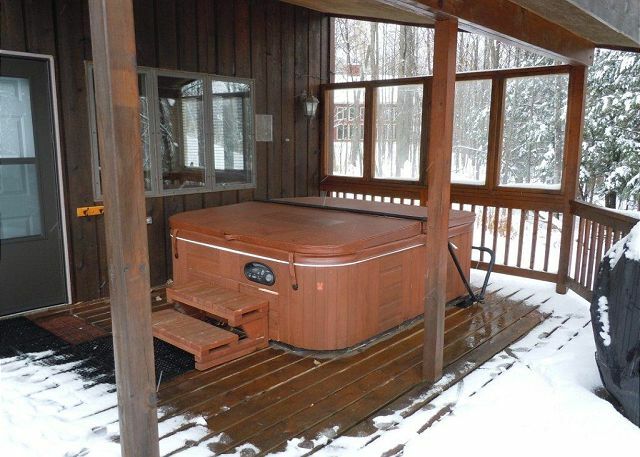 Large indoor ski storage, picnic tables, sauna, Large outdoor hot tubs with adjoining interior doors to accommodate larger groups renting both sides. Trailside access to Alpen Trail and Lift 1. Excellent location, friendly staff and cozy stay! The space was perfect for a families and the ski-in ski-out was a plus. Going to Big Powderhorn is one of my favorite times of the year. We had a great time in the hot tub and cooking meals. We had a group of ten people their mid-twenties and because there is a shared wall that seems to be pretty thin, we disturbed the neighbors a bit so I would say it is more family friendly unless you have both cabins rented. Nothing to complain about very nice place to stay. The Stonehenge Cabin had everything we wanted for a ski vacation (saunas, outdoor hot tubs and a ski in/out location on the hill . Which is why we keep coming back to the Big Powderhorn Resort each year. Location is perfect for a ski in/ski out ski trip. Kitchen well equipped. Hot tub was nice after a day of skiing. Cabin warm and cozy. Great time and townhouse is amazing. We had a great time. We went the day after Christmas so the snow wasn't that great but still very fun! The cabin exceeded the expectations of everyone in my party. Upon arrival my friends were excited to be staying at such a grand cabin right on the hill. It set the stage for good friends to celebrate together and ski. But what really made the trip great/saved it, was the accommodating nature of the management staff, in particular I’d like to thank Tonella Gellar? (I sincerely hope I spelled that right, we only spoke to her on the phone) A slight bump in the road did occur when a family with young kids moved in next store. Everyone has a right to enjoy their vacation and we did not want to bother our new neighbors in anyway but still wanted to stay up late and socialize. We worked with Tonella, said we would be willing to move but in the end it was settled that the family would move to a cabin that better suited their needs. That truly impressed me and my friends thus cementing everyone’s desire to come back next year. Because of Big Powderhorn we all now have great memories that we will be talking about until we make even better ones next year. It was an awesome getaway. Very accomofating! Very relaxing , very clean, easy access to the hill we had little ones skiing & it was great being right there at that hill! We went skiing in January. The property management was wonderful. We had a problem with the hot tub, but they made accommodations to rectify the situation. We always have fun at Powderhorn. Stonehenge 1 is a nice chalet. 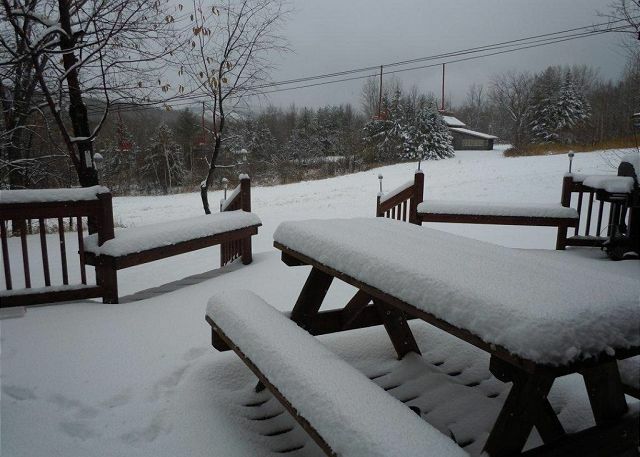 We've stayed at quite a few at Powderhorn, slopeside and we like this one. The management company checks on the hot tub and makes sure it's up to snuff and the place is very clean. The property management people are very good at their jobs. They are thorough and fast with emails and returned calls. I appreciated that a lot. We had college and grad school age family with us and they went to the main lodge for the band on two of the nights. It was just what they were looking for and then some. Everyone was very nice at the lodge/bar. The unit was perfect for us. Clean and had all the amenities we wanted. Great hot tub and sauna. Kitchen area was just perfect. Enjoyed the fireplace as well. Property management people were great. We loved the location! It worked great for our family, which included our adult children, their spouses and our 3 month old grandson. The updated kitchen and bathroom on the main floor were very nice and we enjoyed the outdoor hot tub. Same as the other side! We rented out both sides of this duplex, something I would recommend doing. The place is beautiful and everything is gorgeous. Perfect location. I want to go back. Ski lift 1 was broken down but we made the best of it. The rental office gave us 2 for 1 lift tickets for the inconvenience so that helped. everything else was great. We were delighted with our ski in/ski out slopeside chalet this past weekend. It was just perfect. Great place for the money! The Stonehedge location is perfect!! Great hottub overlooking the slopes. Easy ski in-ski out! Short walk to a great little pub! Comfortable rooms, great bathrooms, plenty of room for 10! Wonderful experience for the whole family! Beautiful! The stay was fantastic, the duplex was ski in/out, had everything you needed in the kitchen, pots, pans, glasses, coffee pot, stove. The staff through out the entire facility was extremely pleasant to deal with. Most places that say they are ski in/out really mean you don't need a vehicle to get from the hill to your accommodations. In this case you are feet from the bunny hill. 10 steps off the deck are groomed trails. We have been renting this same property for several years now and keep coming back. It has a perfect location and all all the amenities for when skiing is done. This unit was very nice. Plenty of room for all. Lots of space in the kitchen/dining area for games and meals. Loved the hot tub and sauna. The only complaint is the hot tub was not working on Saturday (heating element). I paid extra to be hillside and to have the hot tub. This was a big bummer for our last day of relaxation. My family Love this ski hill and staying at the Stonehedge is what we all call our Winter Cabin, been staying there for the past 3 years in a row and well, coming back in 3 weeks! Love it!! 7 friends and I went up to Powderhorn for 4 nights. Stonehedge was perfect for us. The hot tub and sauna were great. The place was big enough for all of us, and the kitchen had a ton of appliances and utensils (stove, crock pot, Pizzazz, coffee maker, electric griddle, dish washer, etc.) We saved a lot of money by making meals in the kitchen. The location is amazing - right on a beginner hill next to a lift. Not that it's necessary, but there was also a nice TV in every room. Nicest place I've ever stayed to ski/snowboard. 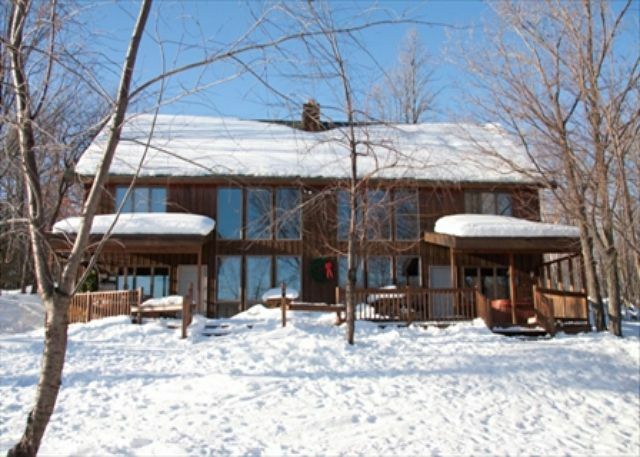 Great vacation rental for ski-in/ski-out! Great location, great property, has an old cabin feel with some great modern amenities. 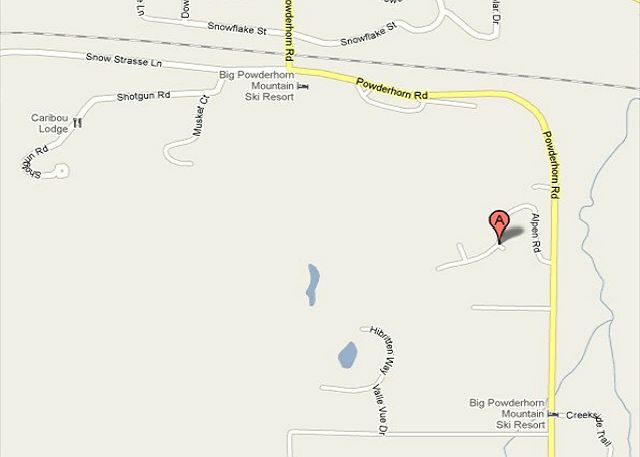 I felt it was priced fairly for the location and the condition of the property. The only negative was the hot tub stopped working and even though a guy came to fix it the water never got back up to temperature. We really like hot tubs so that was a negative for us but others probably will not have the bad luck we did. The owner even called to check and see how our stay was going, very nice touch. I would recommend this place to family and friends. The property was great, the kitchen was wonderful for cooking meals, we used the fire place every night and the hot tub was great too. We were dissapointed that the tubing was not open or the skating rink which we had planned on using.